Another Way to Hold a Guitar Body with Two Holdfasts and a Box! 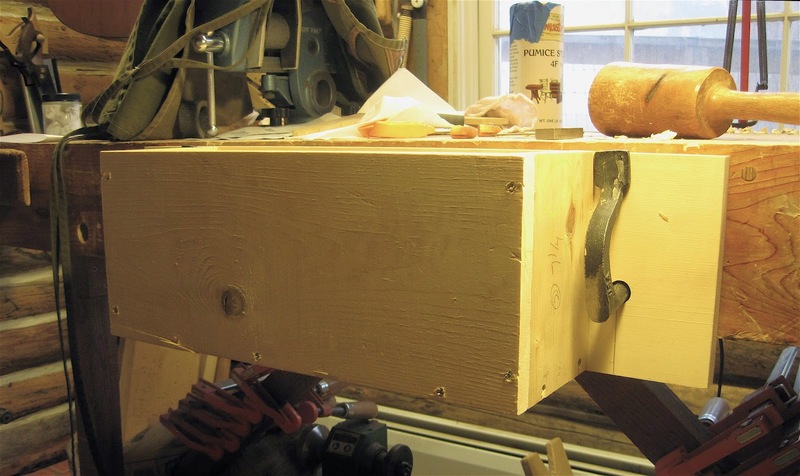 Without some way of holding the work, a workbench is hardly more than a table. 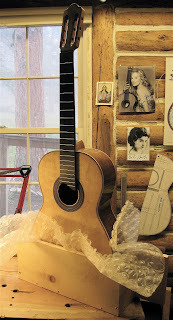 A deadline is fast approaching and I have at least one more French polish session to do on the bearclaw Sitka spruce/granadillo guitar for Kyle Throw, an up and coming young classical guitarist in Denver, Colorado. The trickiest part about French polishing a guitar is where the sides join the heel, you have to really smash down your polishing pad to get the shellac in the corner of the junction. And you can't work the area too much at a time or you will soften the shellac you just put down. A bench mounted vise holds the guitar by the head stock or neck when I French polish, one problem with this is I have a limited view of that junction. Really, I can't the bench light just right to reflect off the shellac so I can see how much I am putting down. Boards cut and ready to go! I decided to remedy that problem today, I decided to make a guitar body holding box that can be mounted to the bench apron. I got this idea from Scott Landis's The Workshop Book. Turn to page 31 of his book and you will see a photo of the workshop of Jeffery Elliot and Cyndy Burton. In the photo you see Jeff working on a guitar that is being held in a box. 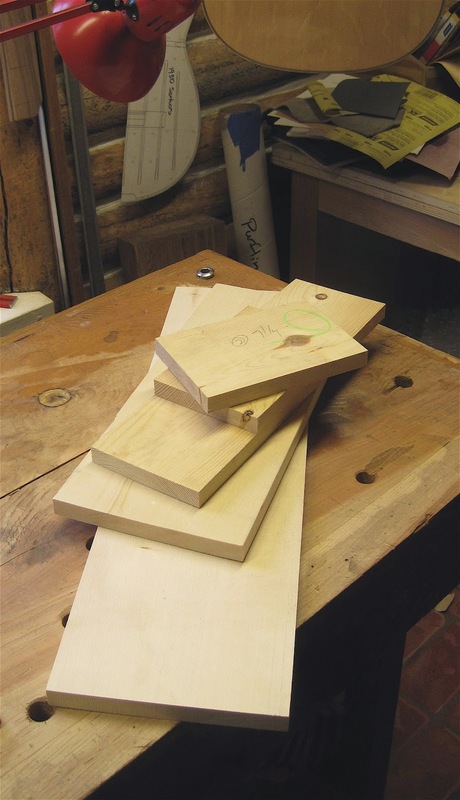 There was a handful of ponderosa/lodgepole pine boards in my other workshop, just right to make the box. No plans needed, I figured two inches wider and deeper than the guitar box. The rest I "eagle eyed". and the hold fasts, well, um, hold the box tightly to the bench apron. 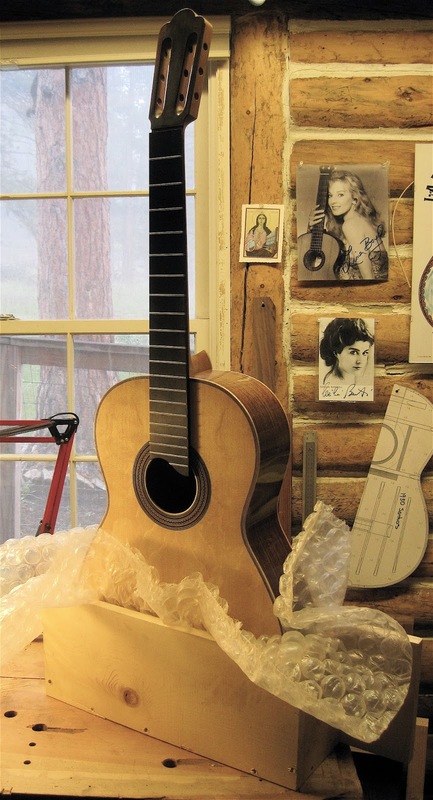 In this above photo, the redwood/Indian rosewood copy of a 1961 Hernandez y Aguado guitar sits well in the box ready for more alcohol/pumice pore filling. 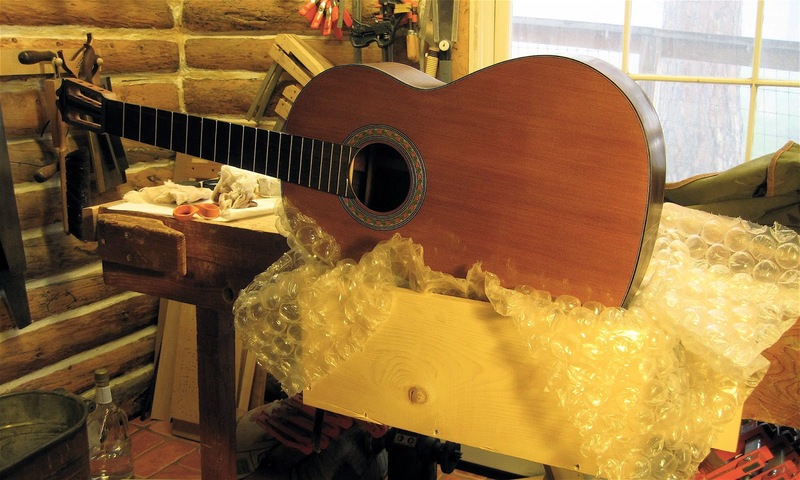 The beauty of holding the guitar in such a box is the quick access to the sides on either side of the heel joint. It means a better job of French polishing! 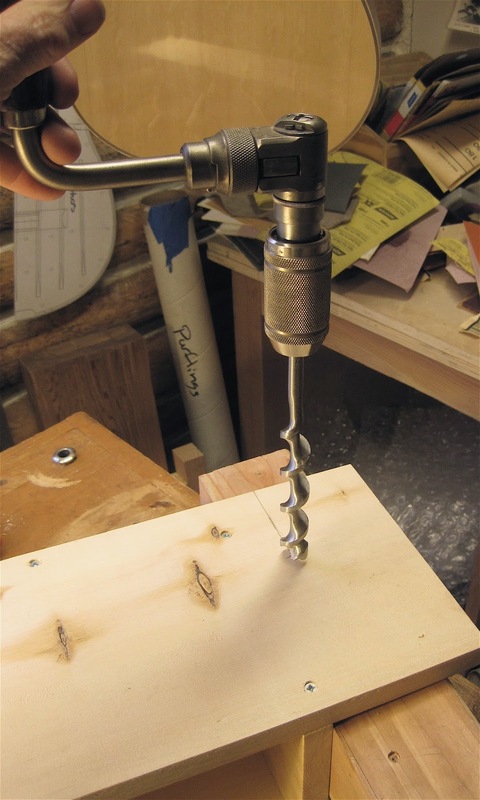 Now, get out to your workshop and make something!